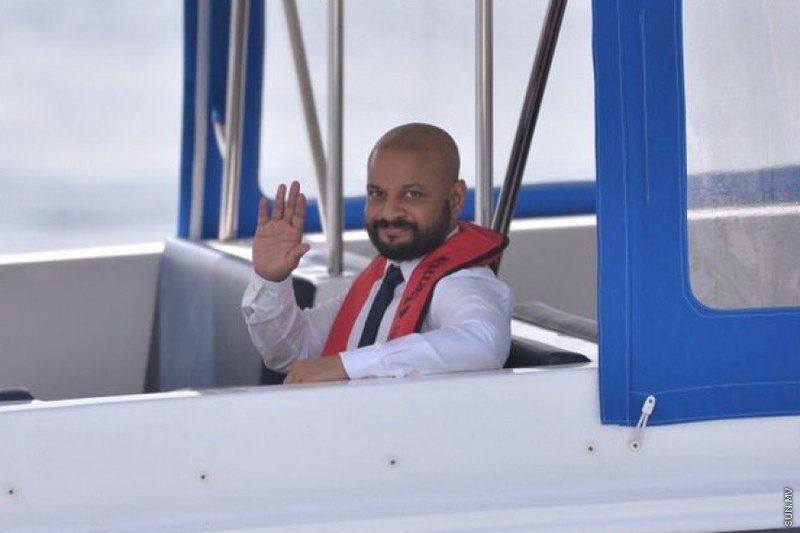 Dhiggaru MP Ahmed Faris Maumoon has been sentenced to four months and 24 days in prison for identity theft. The sentenced was issued against Faris by Criminal Court last Wednesday night. Faris was charged with identity for using ruling Progressive Party of Maldives (PPM)’s logo and flag without its permission in a press conference held at Mookai Suites on March 12, 2017, after he was dismissed from the party. Judge Ibrahim Ali said the court found the charge of identity theft proven against Faris beyond reasonable doubt. And sentenced to four months and 24 days in prison. Judge Ibrahim Ali said the testimony of State witnesses proves Faris had a flag with PPM’s logo at the back of the seat he was sitting on during the press conference, and that he claimed to represent PPM during the press conference. He said that the witness in defense, former RaajjeTV journalist Azmoon Ahmed also testified that there had been a PPM flag at the back of Faris’ seat. He said the State witnesses also testified that Maldivian Democratic Party (MDP)’s parliamentary group leader, MP Ibrahim Mohamed Solih (Ibu) introduced Faris at the press conference by saying he will be speaking on behalf of PPM. Judge Ibrahim Ali said that Faris had been dismissed from PPM when he gave the press conference, and that he therefore cannot use PPM’s logo or flag from the moment he is dismissed from the party. He said that using the PPM’s flag and logo in such a circumstance, and without the permission of either PPM’s Chairman or PPM’s Council will therefore be considered a case of identity theft. The judge said the defense submitted 47 witnesses and 27 pieces of document evidence in the case, of which the court heard testimony from six witnesses. He said the 27 pieces of document evidence bore no connection to the case. During the time allowed the State prosecution and the defense to discuss the punishment after Faris was found guilty of identity theft, Senior Prosecutor of Prosecutor General’s Office, Aishath Reesha said identity theft is ranked as a Level 1 criminal offense, the punishment for which is four months and 24 days in prison. She said the State found no reason to either increase or decrease the level. The defense, meanwhile, requested that it be dropped three levels lower than the minimum level for the offense, and the sentence mitigated to a fine or home imprisonment. Judge Ibrahim Ali sided with the State prosecution and said he finds no reason to increase or lower the level of the offense, or change the nature of the offense.